Discounted rate pass for 5 classes. 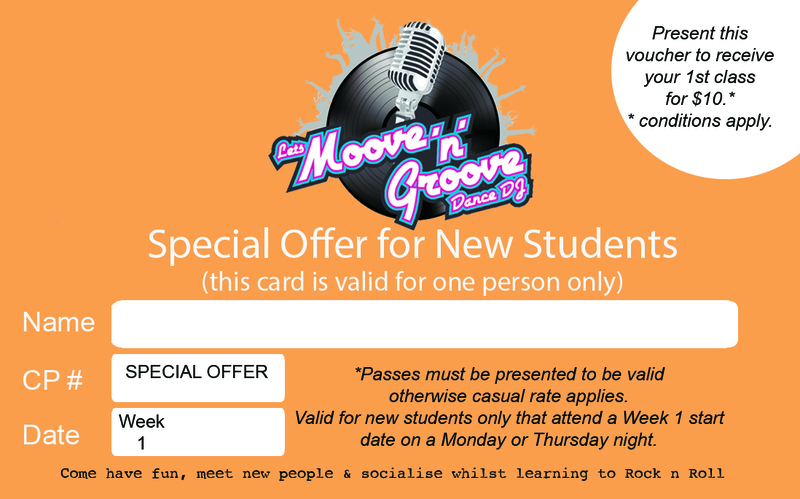 Discount pass for 10 rock n roll classes. Discount pass rate for 5 lindy hop classes..
Discount pass rate for 10 classes at our lindy hop venue. Discount pass for combined styles at multiple venues. Discount pass rate for 10 rock n roll & lindy hop classes. Please note that the Lindy Hop class will run separate to our Rock n Roll classes. Your Rock n Roll passes, Rock n Roll special offers and the Rock n Roll pricing structure is not valid for Lindy Hop. You have a period of 6 months from date of purchase to use your class passes, after this period your passes are no longer valid. Is it your first time to a Rock n Roll dance class? *The special offer can only be used on the first night of the beginner course and is valid for new enrolments only. The special offer must be printed and presented at the door for the discount to apply. To find out course starting dates please visit our locations. Buy someone the gift of dance by purchasing a gift voucher from our online store to any pre-determined value. To purchase a gift voucher visit our online store. * For your convenience we provide a mobile EFTPOS facility. In order to ensure the continuation of the service the following charges apply. Debit Card & Credit Card surcharge of 2% on total purchase. ** We only accept Mastercard and Visa cards.